Oh! I love your table and chairs, love them even more with the fancy new cushions! Is the table also from Ikea? looks fantastic!!! there is never too much orange in a house :) i love this print!!! Thanks! Anna, yep, the table is from IKEA, too. It has two leaves inside that can expand it to twice its current size. Awesome for dinner parties. What a good idea, and so easy! No fancy upholstery skills needed. They look great! As long as you stick to a diet of cheetos and carrot soup, you may never have to recover them again. They look great! That pattern looks awesome with the wood grain. VERY cute Jessica! I love your fabric! :) Nice work! What a quick and easy way to spice up a simple table set. Love it! Clever!! And very pretty indeed. Wow! That really makes your dining room set look like a charming vintage set now. I'd love to do that to my dining room chairs, but they have fabric on the backs of them and I have no idea how to get that off! Love it! So cherry. And so easy! 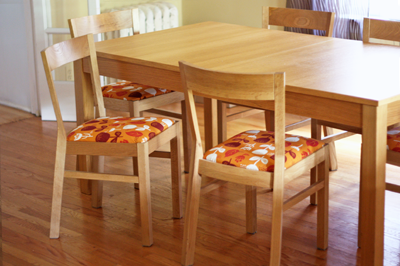 Inspiring - my dining room chairs need a little help so maybe I'll tackle this project soon! Thanks! I love this! Such a fun makeover. Thanks for sharing the steps to achieve it, too. Really looks great! Nice makeover! I did the same thing with my Roger chairs! We're nearly ready for a third layer. Love your fabric. Poppyprint, you crack me up. Cheetos and carrot soup. Roger that. Har, har. They look great! Very funky! How brilliant for you to look at your chairs and know that you designed the fabric too! Well done! I keep forgetting that I really really really need to buy some OO. Thanks for the reminder, chairs look awesome! What a fantastic and easy fix. It adds such a great pop of color to that room. You never cease to inspire! Love your fabrics. Orange is next to green one of my favorite colours too. These chairs are fantastic!! It makes me think I should actually make those giant pillow cases from your fabric line a reality!! Beautiful!! I love the fabric! It works so well with the furniture! your prints make everything look out-of-an-awsome-graphics-book perfect! oh, and just so you know... i'm using the 382C Pantone wallpaper from your previous post. LOVE IT! You did a great job with these, so cute! 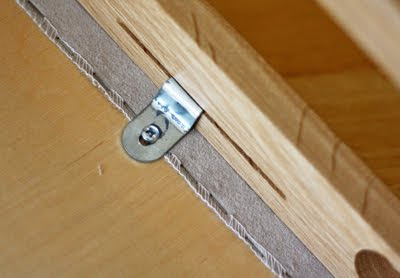 I'm always so inspired by people who have a knack for DIY projects, something I am definitely trying to develop! Rebecca, you are completely capable, I'm sure. now that I have seen these chairs with this print, I think its a MUST have! I have Ashley chairs but I think it would still be pretty easy to recover them. Is your fabric water resistant by chance? I have a home daycare plus 2 boys of my own! oh yea, do you buy chance send fabric samples? Sure Sarah! Just send us a note through etsy with your address and we'll send you whatever swatches you need - free of charge! They look absolutely amazing! I'm so impressed you were able to do this yourself. 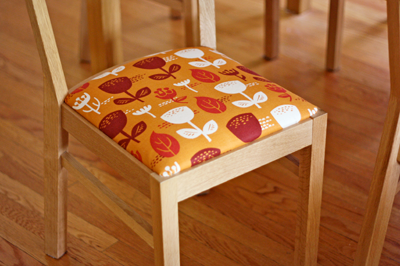 And of course, love the orange fabric. OMG!!! You need to see what I posted on my blog this week. This is too Funny! I got my table and chairs at Ikea too! Dying to do this. I'd love to order your lovely fabric and do this to my "craigslist" table. How many yards of Jessica Jones fabric would I need? Not sure what size your chair seats are, so I can only tell you how much I used: I could fit three seats across the width of the fabric, and I needed about 22" of height for each seat. Lovely looK. Orange, naturally. The last chair I remade was also orange! The fabric and chairs look like they were made for each other! They look great. Wow! These look amazing! Nicely done! We have the same table and chairs! I may have to recover mine soon - yours look so much more fun now! Can you give me the color of your dining room walls? Love the look!! I have just come across your lovely blog and will probably get no work done today as I want to read the entire thing. I am a web and graphic designer too Indigo Image and live just a bit up the road from you in Lincolnshire. I have a bit of a thing for indigo! Such a cute fabric! I've been meaning to do this to my kitchen chairs as well for a while now. Thanks for the inspiration, I'm definitely going to get on that soon seeing how great yours look! Beautiful fabric and color choice. Love this!!!! Fatima, not sure what kind of shirt you're looking to make, but you could try Google searching for shirt tutorials. Creative in Chicago: I'm not English and I can't remember at all how I started calling my mom "Mum" or "Mumsy." It started as an affectionate silly thing, and stuck! 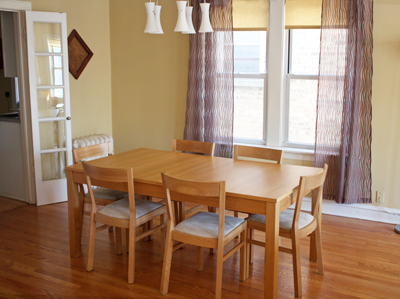 Amy, the dining room is Behr's Expedition Khaki color. Mumsy is nice! I occasionally get called Mumpski. If my daughter has her friends around she feels it a real no-no to call me Mum...I become a Mom! I gasped audibly when I saw the "after!" Beautiful. Your chairs look great. Love that fabric. The fabric is beautiful and it looks perfect in your chairs. My dining room chairs are screaming "help"! Thanks for the inspiration! What a great way to spruce up the dining room set. The fabric you have chosen is quite vibrant. Hey, now. Those look pretty fantastic. ;). ~<3~. I covered my version of your chairs with black ultra-suede. They really pop with the contrast. All I know is that I despised my kitchen chairs. They were a great Craigslist bargain, but ugly as sin. You inspired me to pick up some new fabric and cover them. 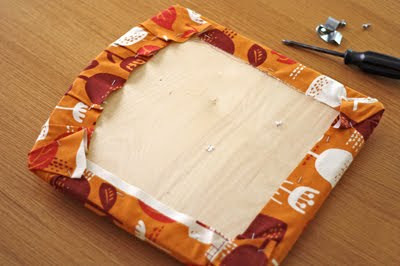 I'm going to use the leftover fabric to make matching placemats and napkins! Cute fabric! I have the same chandelier as you.